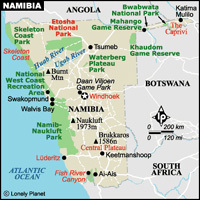 Namibia is on Africa's south-west coast, bordering South Africa in the south, Botswana in the east, and Angola in the north. The country is largely arid, but encompasses broad geographical variations and is usually divided into four regions: the Namib Desert and Coastal Plains along the coast; the scrubby, eastward-sloping Central Plateau; the Kalahari sands along the Botswana and South African borders; and the dense bushveld (woodland) of the north-eastern Kavango and Caprivi regions. The Namib Desert, the world's oldest arid region, has been around for over 80 million years. It extends along Namibia's entire Atlantic coast. Namib landscapes range from the mountainous red dunes in the south to the centre's interior plains and flat-topped, steep-sided, isolated mountains called inselbergs. The desert is scored by a number of rivers that rise in the Central Plateau but seldom carry water. East of the desert, the altitude increases and the dunes give way to gravel plains.